The teaching materials for the learning experience on “The Godhead” are divided into two parts. Part 2 contains a practice exercise that will help students apply the doctrine they learned from the Doctrinal Mastery Core Document and the doctrinal mastery passages found in Doctrine and Covenants 130:22–23 and 29:10–11. This lesson also includes a cumulative review of all of the doctrinal mastery passages that students have studied so far during the school year. Note: The practice exercise and the doctrinal mastery review in this lesson may be taught in a single class session or during two separate class sessions. If they are taught during two class sessions, allow adequate time for your regular sequential scripture lesson from the Doctrine and Covenants. Divide students into missionary companionships. Provide each pair with the accompanying handout, and give students sufficient time to complete the assignment. Read the following scenario aloud with your companion. You and your companion are missionaries. You meet a pleasant elderly man named Ben. You talk to Ben and set up an appointment with him. When your companion asks him what his beliefs are about God, Ben says, “I’ve always thought of God as an essence that is everywhere at once.” You and your companion both feel that it would be helpful for Ben to understand the true nature of the Godhead. Be ready to teach your lesson to the class. Note: You may want to adapt the scenario according to your students’ experiences and needs. You may also want to substitute names that are more common where you live. Conclude by testifying of the truths discussed in class. Invite your students to look for opportunities to help others gain a correct understanding of the Godhead. 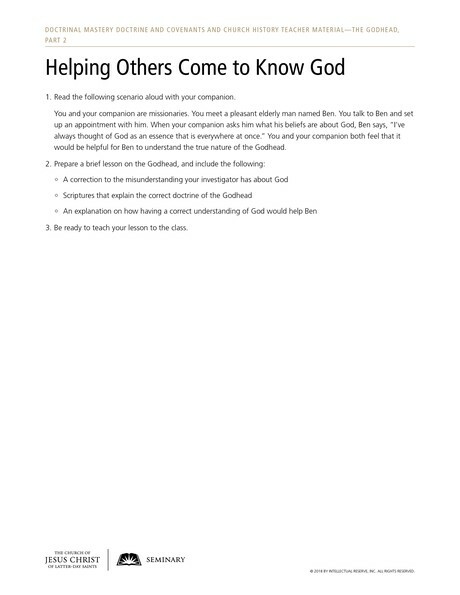 To help students deepen their understanding of these doctrinal mastery passages, ask them each to choose one passage for the following activity.